Santorini is a volcanic island in the Cyclades group of the Greek Islands. It's a popular island to visit for it's dramatic setting and beautiful sunsets. There are several towns throughout the island that are fun to visit including Oia town and Thira. Popular beaches on the island include Perissa and Kamari. 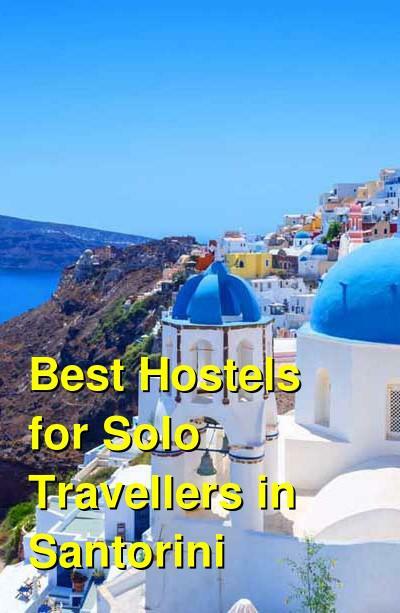 If you're traveling alone or looking for affordable accommodation, there are a few good hostels around the island, many of which are in or near the main town of Fira. 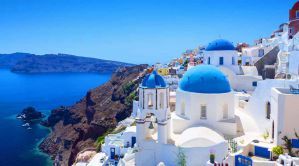 How much do hostels in Santorini cost? Caveland is a popular hostel in Santorini for all types of travelers. It's located in a beautiful old 18th century winery in the local village of Karterados. It's about a five minute drive from the island's capital of Fira Town, and has a beautiful setting that lets you feel like you've stepped back in time. The hostel has a lot of atmosphere, with eight traditional cave houses, a historic apartment, and plenty of beautiful outdoor space. There are terraces that offer views of the ocean and a large pool that is surrounded by gardens. There's also a shared kitchen that guests can use to prepare their own meals, a book exchange, and a barbecue area. The hostel hosts barbecues a few times a week, and breakfast is included in the price of the room. If you're a female traveling alone, there's a single private room available (limited to females only). There are also twin, double, and quad private rooms available as well. If you're on a tighter budget, you can stay in one of the dorm rooms, that include four bed female rooms, and six and ten bed mixed rooms. Stelios Place is one of the most recommended bed and breakfasts in the area. It's highly recommended by most guidebooks and its an affordable and unique option for travelers of all types. The hotel is beautifully located just 30 meters from the island's most popular beach, Perissa Beach, in the southeastern part of the island. The beach spreads across seven kilometers and is made up of black sand that comes from lava. In the area you'll find plenty of bars and restaurants, water sports, and diving options. The hostel offers guests a variety of amenities including private balconies, a refrigerator, and wi-fi throughout. The breakfast is delicious but comes at an additional charge. The hostel also has an outdoor swimming pool and a shared kitchen which guests can use. The staff at the hotel are wonderful and helpful. This is a hotel, not a hostel, so it does not have the atmosphere of a hostel, but still, it is possible to meet other guests around the pool or at breakfast. Fira Backpackers Place is an affordable option for travelers who want to stay in the downtown area of Fira. Fira is the capital of Santorini Island, and it is where you'll find the main bus station for the island. It also has a nice main square, excellent shopping, some good museums, and plenty of restaurants, bars, and grocery stores. The hostel is a good option for solo travelers who want a more traditional hostel environment. There are both dorms and private rooms available, as well as a shared kitchen, laundry facilities, a nice living room, board games, and movies. It's a great place to meet other guests and make some new friends. If you're traveling alone and want to meet other guests, then this is the place to stay. The staff is also very helpful and they can help you with any travel arrangements or questions you might have. There are private rooms that range in size from twin rooms to six beds. There are also four, six, eight, and ten bed dorms available. The four bed dorm is female only, as are some of the six bed dorms. Villa San Giorgio is a nice bed and breakfast in the middle of Fira. It's surrounded by the town's best nightlife, with many bars, restaurants, and cafes nearby. It's also very close to the bus terminal and great shopping. The bed and breakfast is located in a new building that has comfortable furnishings and good prices. All rooms have their own private bathroom as well as a balcony, refridgerator, and television. The hotel has a warm atmosphere with friendly staff. They can offer you all kinds of travel information and are very knowledgeable about the surrounding areas. If you're traveling alone and looking for a nice place to stay in Fira that isn't a hostel, then this is a good option.